Vegetarian Cookster: BBQ Pomegranate Tofu with Coconut Rice. 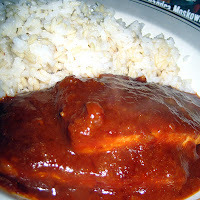 Monday night's dinner was BBQ Pomegranate Tofu with Coconut Rice. The BBQ sauce is absolutely AWESOME. I plan to use this sauce recipe if anything else I make in the future requires BBQ sauce... that's how tasty it is! But, I came to the realization that I need a bigger kitchen, LOL. Mine is an older-style modest-sized kitchen... definitely not one of the grand "cooking" kitchens I drool over in magazines. Which is usually fine for the often simple recipes I make myself as a bachelorette. Sometimes, though, I feel I need more counter space, which was oh-so-obvious as I tried to make both the tofu and the rice recipe at the same time. Or, maybe I just need to plan better... or make this recipe more often so that I become familiar with it and can jungle all its tasks with ease. I may mod this recipe in the future... next time I might try frying the tofu in the oil mixture before smothering it in the BBQ sauce and baking it. And, I used half white rice, half brown rice for the Coconut Rice recipe... but next time, I think I'll make it exactly as stated with the Jasmine rice. I bet it tastes better that way. I can't forget to mention that the Pomegranate Molasses--which I found at Whole Foods Market--used in this recipe is delicious! I don't really taste it in the finished sauce, but I tried it in its own. (Yes, I licked the drip that decided to escape down the bottle!) I would love to make some pancakes or waffles and drizzle the stuff on top. Mmm, mmm. And, sorry for the crappy photo... I need to work on my food art photography skills! Thanks for your post! I love this recipe, too. So many of my vegan friends haven't tried it yet because they don't have any pomegranate molasses. While I'm sure pom molasses is wonderful (as you write!) I've been doing just fine using regular old blackstrap. I make a couple other substitutions, too... I'll be making a blog post with those changes, soon, if you're interested. Thanks again! :) And happy eating.